The highest concentration of vernacular buildings is found in County Donegal. 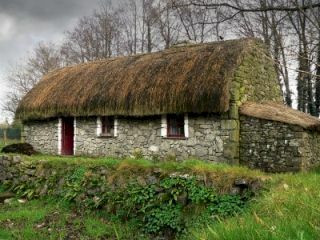 In Ireland, genealogy researchers studying the first half of the 1800s are hugely reliant on property and land records. This is because civil registration was not introduced to the whole population until 1864 and all returns for the 19th-century censuses are lost to us. Admittedly there are plenty of church registers that date back to the 1820s and a good number that go even further back. But registers for many parishes, including two-thirds of those for Church of Ireland congregations, do not survive for this period. This is why so many people believe that in Ireland, genealogy resources for the period before the middle of the 19th century are very thin on the ground. But there are resources available: property and land. They aren't as easy to access as the more obvious ones mentioned above but if you are looking for Irish ancestors pre-1860 you need to get to grips with these collections. 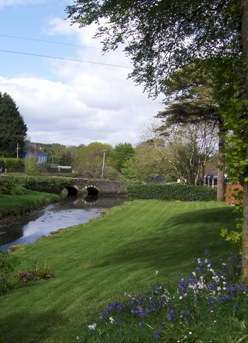 This page gives you a summary of the main Irish land and property resources. If you're searching for ancestors pre-civil registration in Ireland, genealogy gems don't come any better than this. The full name of this outstanding resource is the Primary Valuation of Ireland and it was carried out by Richard Griffith, a Dublin-born geologist. Between 1847 and 1863, he and his band of Valuers travelled around the country studying one county at a time. The results of his survey were published between 1848 and 1864 (download pdf map of Griffith's Valuation publication dates by county). It was arranged by county, barony, Poor Law Union, civil parish and townland and includes an assessment of the value for every property within those boundaries. The name of each head of household is also recorded. Find out more about Griffith's Valuation and how it could help your Irish family history research, or study some examples to become familiar with how it is structured. In 1823 the system of tithes payable to the Church of Ireland was revised. A valuation was carried out, civil parish by civil parish, to determine how much would be payable by each landholder. The process took 15 years, until the tithe was suspended in 1838. Find out more about Tithe Applotment books and their value to Irish genealogists. A round-up of the 32 historical counties in Ireland. Still looking for your Irish ancestors' townland or county? In 1876 a list of landowners who held at least one acre of land was published. The survey had been commissioned in 1873 by the Local Government Board and required the Poor Law Unions across Ireland to gather together lists of landowners from local rate books. The last of the returns to the Board was dated November 1872. When collated, some 32,614 owners were listed alphabetically by province and county, alongside details of the extent of their land and its current valuation. The 1876 list is available, free, at Failte Romhat. These records offer the best opportunity to trace Irish ancestors into the 18th and even the 17th centuries. They include information about the wealthy families who once owned great swathes of Ireland. Genealogy researchers find them useful because these families employed vast numbers of retainers ie domestic staff, farm hands, stone masons and other craftsmen, and were also landlords, granting leases to tenant farmers and labourers. Estate records can be difficult to track down. Some remain in the family's archives; some have been deposited with solicitors; an increasing number are being deposited in local archives (who may or may not have the resources to cataglogue them). Others, inevitably, have not survived. Where they do survive, however, they can be of variable quality but they can sometimes provide spectacularly good detail. After the Famine, many landowners found themselves financially if not morally embarrassed. Parliament set up a Court to administer the sale of these insolvent estates in 1848/9 and pre-sale catalogues were produced to entice prospective buyers. These sale particulars provided details of tenants on the land, together with the value and terms of their tenancy or rental commitment. They cover the entire island of Ireland. Genealogical potential is significant, since more than 500,000 tenants are recorded in the collection. Find out more about Landed Estates Court Rentals. Records for the Republic are online. The 32 historical counties in Ireland - an alphabetical listing. The Registry of Deeds was founded in Dublin in 1708 but its heyday, in terms of popularity, was 1750-1830. While it covers arrangements for a lot more than land, the Registry can be very useful for finding out when land was transferred from one party to another. By far the majority of the Irish population owned no land nor anything else of such value that its ownership needed to be formally recorded, so this resource is not going to assist many family historians. However, if your family did register deeds you are in for a treat as these records frequently mention two or more generations. I'll be adding details about the Registry of Deeds shortly. A round-up of the 32 historical counties in Ireland - an alphabetical listing. Over the centuries, many different land measurements have operated in Ireland. Genealogy researchers should make allowance for such discrepancies when studying land records, in particular the two most widely adopted: the Irish (or Plantation) acre of 7,840 square yards, and, from the 1820s, the Statute Acre of 4,840 square yards.